This is been such a yummy week so far! Day 4 S'more - graham cracker, marshmallow cream, and Ghirardelli Dark with Orange filling. I'm a huge lover of anything citrus and I think this has been my favorite so far this week! The idea here is to use a different chocolate in your s'more. Another twist, and the thing that started this series, was this s'more I made a few years ago - with a Reese's Peanut Butter cup in it. Today's a two-fer! Two new s'more ideas! 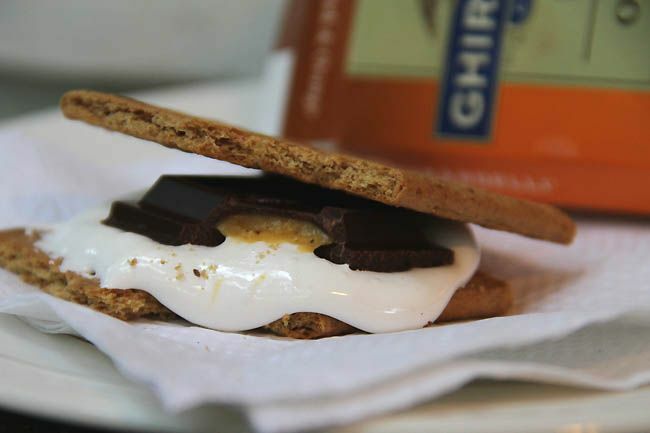 Have you tried any new s'mores this week? What's your favorite way to have them? I LOVE the soft Ginger or Oatmeal cookies from Kroger bakery with chocolate frosting and a toasted marshmellow. My friend's dog kept stealing mine out of my hand while I was talking. I put peanut butter on mine though. You have given me some great ideas! Especially with fruit; I cannot wait to try a peach s'more this weekend! I tried to get s'mores stuff today and the commissary was out of marshmallows. Seriously! Apparently you've inspired lots of s'more making in the Fort Campbell area! How's your week? Besides being yummy! Oh yes, the Reese's one will be mine. What great ideas!! Oh my!!! It is s'mores season, isn't it?! Thanks for all the ideas. We love peanut butter and chocolate! 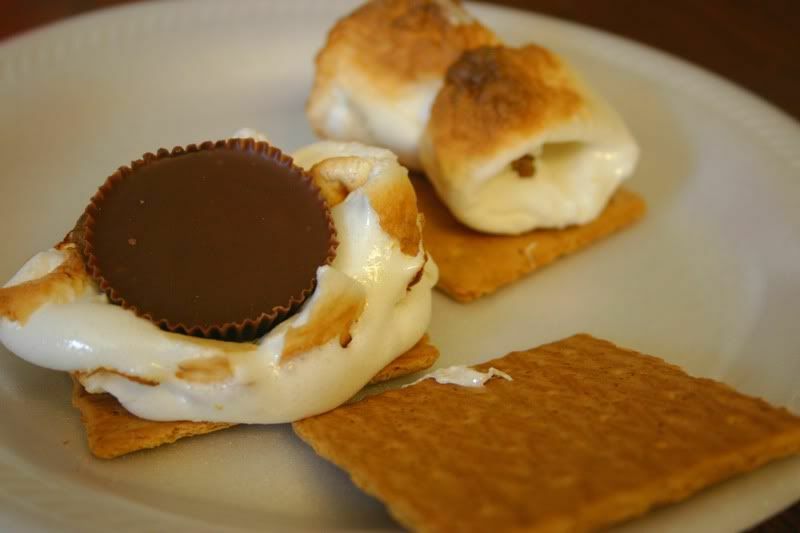 Our creation for a s'more is to frost one graham cracker with chocolate frosting and spread peanut butter on the other! Then sandwich our toasted marshmallow in the middle! Oh Beki...that is my favorite chocolate bar next to a Reese's!!! And then you blogged about both???!!! Oh my word, I am truly one lucky, lucky gal!!! Thank you for brightening up my summer with these yummy goodies! Cannot wait to try them. Oh, and you totally rock! Hope the painting is progressing for you and can't wait to hear about your changes. Blessings to you all sweet family!